Fernando Alonso is a Spanish, two-time F1 racing World Champion and a current Viceroy ambassador. 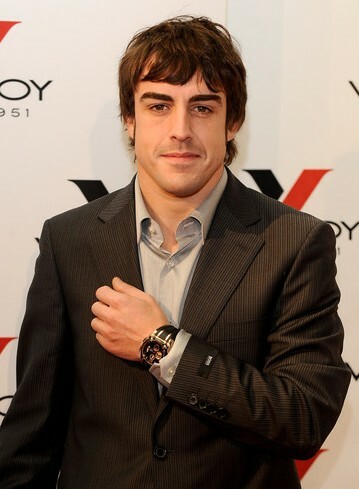 And who better to represent the Spain-based watch company than this stylish, young racing icon? Watches in Viceroy’s “Racing by Fernando Alonso Collection” reflect the sport’s mechanical foundations and intercontinental sensibilities. The 43 mm case of this Special Edition model is made of stainless steel and the bezel, also in stainless steel, is coated with IP for a harder, scratch-resistant surface. Four hexagonal screws, reminiscent of lug-nuts that fasten a wheel to a car’s axle, secure the bezel to the case at each corner. The crown is fluted and the watch is water resistant to 165 feet. Red accents highlight the black dial, as do raised silver hour markers and skeletonized two-section hands in silver and black. 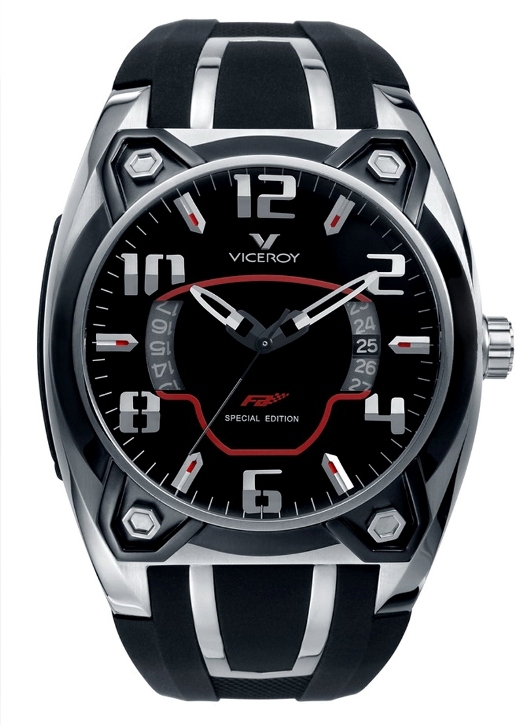 The Viceroy logo is centered vertically below 12 o’clock; the Fernando Alonso “Fa” logo and the words “special edition,” also centered vertically, appear above 6 o’clock. One of the most distinctive elements of this watch is the way the two red lines in the central part of the dial combine to create the top and bottom shapes of an F1 steering wheel. Even more original is the way Viceroy integrates the circular date wheel so that it looks like the steering wheel’s left and right handlebars. To achieve this effect, Viceroy opens two apertures in the dial to display a transparent date wheel with white numbers placed over a gray background, except in one square at 3 o’clock where the wheel moves above a black background to indicate the actual date. 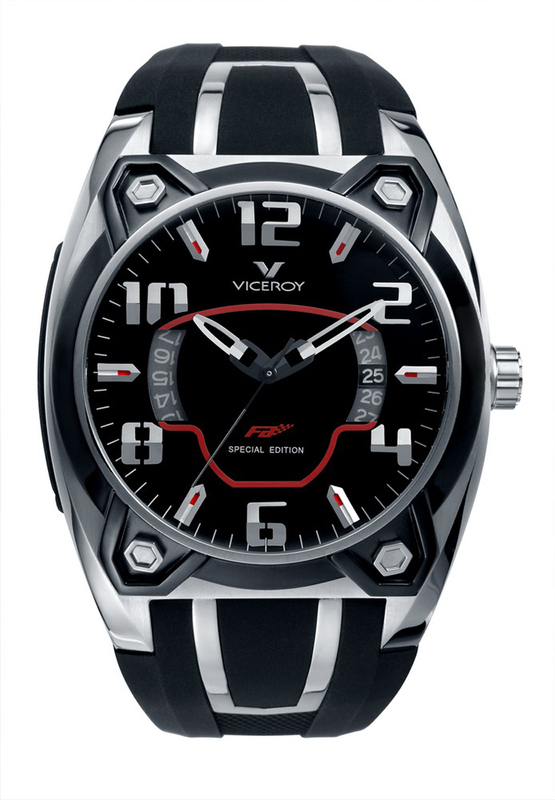 The front crystal is mineral glass and the caseback is again personalized with the Fernando Alonso logo. The movement is quartz. 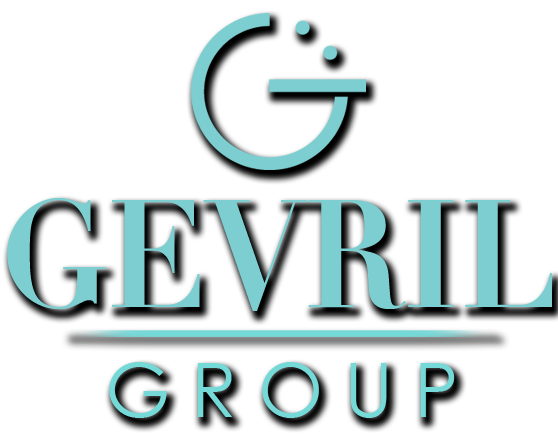 A tapered, black rubber strap is perfectly integrated with the case by way of a firm stainless steel adjunct on the strap that appears as though it extends directly from the case. The effect has a remarkable way of unifying the look of the watch, which is a sure stand-out whether it’s worn to complement your best casual attire or to kick-start your spirit while cruising along the nearest freeway.